Not all of these episodes in this collection are related to Christmas, but they are all pretty good! Some are around birthdays or celebrations, but a good portion of them are about Christmas. This collection is a follow up to the two previous collections, and it covers a wide range of shows that are loved and adored from the Cartoon Network. This collection has some great holiday episodes from some very popular Cartoon Network properties. 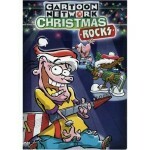 There are other Cartoon Network Christmas collections as well. These adorable holiday episodes are funny, delightful, and would make a great addition to your holiday video collection.